2H offshore, riser and conductor specialists in subsea services group, Acteon, has completed the installation of a Retrofit Conductor Supported Platform (CSP). This enabled a successful appraisal well to be transitioned to production in 26m water depth, offshore Bahrain, within 6 months of project award. On behalf of Bapco and Schlumberger, 2H Offshore designed a tripod CSP with boat landing that can support three surface trees with a total work area of just 90m2. The platform was a particular challenge as it was clamped retrospectively onto the drilled conductor under an already installed surface tree. Additional conductors were driven to provide support for the CSP and enabling two potential future wells. 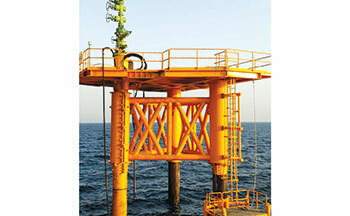 The CSP consisted of a subsea template, a top platform, top brace structure, single deck and boat landing. Keeping the structures small reduces transportation costs and allows the use of the jack-up rig for installation avoiding mobilisation of a dedicated installation vessel. Together with the use of readily available standard material and local fabrication options, the modular and minimal CSP solution enables many opportunities to drive costs down. The structure was installed entirely by Shelf Drilling’s Key Hawaii drilling rig, aided only by an observation ROV. In addition to the design and engineering, 2H Offshore managed fabrication and supervised offshore installation on-site in Bahrain. 2H subcontracted Arab Shipbuilding & Repair Yard (Asry), Bureau Veritas, as well as sister companies Claxton Engineering and Seatronics who all contributed to the successful completion of the project. Hassan Saleh, Principal Engineer at 2H Offshore, said: "Completing this project within the tight timeframe despite the challenge of retrofitting it under an installed tree, shows that with the right design and excellent network, a fast-track, light-weight, retrofit structure is an excellent choice for many shallow water fields. Seamless collaboration with our clients, and the professionalism from Asry, the local fabrication yard, ensured this project ran efficiently, to specification and on schedule."